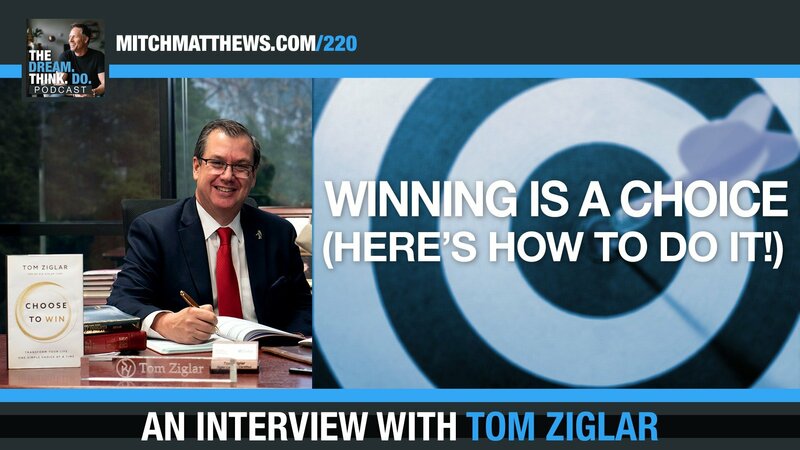 My guest is Tom Ziglar. Among many things, Tom is the proud son of Zig Ziglar. He’s also a bestselling author and international speaker. Mitch Matthews: Tom is also now the CEO of the Ziglar Corporation. Tom joined the Ziglar Corporation in 1987, but he started at the bottom. In fact, he started in the warehouse and routed through sales that went on to management then moved into leadership. He also speaks around the world and hosts the wildly popular Ziglar Show podcast. So you should check that out. He carries on that Ziglar philosophy. I love that. That was a life changing quote for me. His new book coming out is called Choose to Win: Transform your Life, One Simple Choice at a Time. When I heard about it, I knew I wanted to have Tom on the show because he’s the real deal and he’s all about getting you strategies that actually works. So let’s get to this. Tom Ziglar, welcome to Dream, Think, Do buddy. Tom Ziglar: Oh man. Mitch, thanks for having me. Mitch Matthews: Absolutely, this is an honor my friend. I’ve been following you for a while in a good way, not in a restraining order kind of way. Tom Ziglar: Are you stalking me? Mitch Matthews: Yeah, in a positive stalker kind of way. So yeah, take that however you want. I love it. I’m sure you get questions like this a bajillion times over, so I apologize, but I just have to ask, what was it like to grow up in the Ziglar household? Tom Ziglar: I’ll tell you, it was amazing. I tell people all the time as good as dad was on stage, he was even better off stage. He was just … When you think of, gosh, what would be the ultimate earthly father. Mitch Matthews: The redhead. Yes. Tom Ziglar: Dad said he never would have heard of Zig Ziglar if I hadn’t been for the redhead. And so just to grow up in that family and Dad was always … He never put the pressure on. He never said you’re going to be in sales or you’re going to be a speaker. He always said, hey, whatever you want to do, whatever your passion is, whatever your why is just … I want you to pursue it with 100% effort and 100% integrity. And so, when you’re raising kids, I mean what better message could you have than than two parents who set the example. They’re always there to talk and then they’re behind you 100% as long as you’re doing it with an integrity and effort. I mean that’s … You can’t ask for more than that. Mitch Matthews: That’s a beautiful thing. It is amazing and it’s … I’ve had some other folks that had famous parents and it’s interesting how that’s not always the case. Sometimes that outer appearance is wonderful, amazing, but when they get home, they’re a different person. So that’s not surprising, but it’s beautiful to hear. Well one of the things I wondered about too was, what was that conversation like when you’re deciding, hey, I think I want to come and work for Zig … the Ziglar Corporation. What does that … what does that conversation look like? Tom Ziglar: Well, I’ll tell you what, it was pretty simple. I played golf in college and my goal was to be a professional PGA golfer and I graduated from college and I needed money to support my golf habit and I needed flexibility. Tom Ziglar: And dad was behind that 100%. And so I started off in the warehouse working [inaudible 00:04:49] depending on the time of year, 25 to 35 hours just there packing boxes and doing production work. And then I was playing golf 40 to 50 hours practice and playing. So I had the flexibility, which is great to have that flexibility. And then I realized that those guys out there are really good after about a year and some injuries and I thought, you know what? Golf’s not my future. And I moved into sales and I fell in love with it. The first time that it really connected that we’re not in the book and tape business. We’re in the life changing business. When you hear the story firsthand, you know how it is when somebody comes to you and says, man, this changed my life. There’s nothing cooler than that. Mitch Matthews: It’s so true. It’s one of those where it’s like, all right, oh man, I wish I could do this for free. I don’t do it for free, but I wish I could do it for free. I would do it for free. I just … it’s … that is awesome. And to then be on that trajectory, I mean that’s a beautiful thing. We talk to so many different people about kind of finding their dream job and it’s usually they’ve found it while they were on the way to something else, but they had to give themselves that chance to experiment, to try some different things. Even make things work financially while they were on this journey and they uncovered something else entirely. Tom Ziglar: Yeah. And you know what’s interesting is a lot of people are already in their dream job. They’re just looking at it wrong. I was working with a guy, doing a little bit of coaching and he’s like … He had an HVCAC business and he said, “I’m going to buy a plumbing business.” And I’m like, ” Do you like plumbing?” He goes, ” No, I don’t like plumbing.” And I go, “Oh, okay, well do you like HVAC?” And he said, “No, I don’t like HVAC either.” And I said, because this guy knew the answer, I said, “Well, what do you like?” He said, “God’s given me the gift to know how to run these businesses successfully. What I love doing is helping people achieve their dreams and goals. And so when I create a business where I can work with these people who have families and I helped them move towards their dream and goal, that’s what I get excited about.” And it’s just a little different change in perspective isn’t it? Tom Ziglar: Why we do what we do and so even if we’re not in the place we want to be, even if we just adapt that … adopt that mindset of, wait a second, maybe it’s the people I’m with every day that I’m supposed to pour into. And it changes how you do your job, which gives you more opportunities. There is no downside to that approach. Mitch Matthews: Yeah, that’s exactly right. And that’s not, that’s not rainbows, butterflies and little ponies. That’s not looking at your garden and saying, there are no weeds, there are no weeds. That’s saying, no, no, no, wait, why am I here? What am I really good at and how am I already doing that, which is fantastic. That’s a great segue, because I know … Again, the new book, it’s called Choose to Win: Transform your Life, One Simple Choice at a Time. You cover a lot of ground with it, which is fantastic, but one of the places you start is talking about getting clear on your why and that’s been a popular subject on Dream, Think, Do, but I always love … Everybody’s got their unique take on helping to get clear on that. Because it sounds like a great thing, but actually when you get to the nuts and bolts, there’s not a lot of people that have taken that step to figure out, okay, what is my why? So when you guide people on that, first of all, why do you think it’s important, but also how do you help them to do it? Tom Ziglar: Well, here’s why it’s important. When you clearly identify your why, it changes your how, which opens the doors of what. Tom Ziglar: So what does that mean? Well when you figure out like Josh did in his business, his why, it totally changed how he did his business, which attracted all the kinds of right people, not that he doesn’t have problems, but when a good one shows up and they see the environment, they’re like, whoa, this is kind of different. I like this place. And so now the of what open up. Well now he’s got the right people. He lives in a place for HVAC is seasonal. Plumbing’s not seasonal. And so he says, you know what? I wish I could bring my guys more work during the times when HVAC’s not a big issue. Tom Ziglar: When is … Heat’s a big issue when winter starts and cool’s a big issue when summer starts, but in spring and fall, neither one of those two things are percolating, what else could we do? How could we keep them busy? And so, hey, you know what? These guys all have the skills to do plumbing. If I went out and acquired a plumbing company with a master plumber and they brought their skills inside, that’d be better for all of us. So you see how the why changed the how, which opened the door of what. Mitch Matthews: Yeah, absolutely. And him getting clear on … I’m sure is probably could build all sorts of different types of businesses, but then realize, okay, what’s my part? My why is creating that space, building the business, allowing people to be able to provide for their families, all of those things, so that’s a beautiful thing. So when you help someone to start this process of getting clear on their why, so they can start to make the best choices, the choices that are right for them, and help them to achieve more, what are the nuts and bolts? What are some of the things that you do with the person to help them get that clarity? Tom Ziglar: Okay, I’ll do … I’ll give you two models that I use. One of them I’ve kind of borrowed and adapted and another one, I don’t know where it came from, maybe it’s a God thing. So if we look at our life, we have 360 degrees and we could go in any direction, okay. Now, I’m a big believer that you may not know exactly the one point that you’re going after, but you probably have a pretty small pie chart area that you could go towards. So sometimes in discovering our why, we just need to get clarity on the direction we want to head and then as we get more information, we start honing in the final destination. When my daughter was in high school, we did this big assessment on her to see what her natural gifts and talents were so that when she went to college, she would start thinking about these are the types of classes that I want to take that could help me end up in the type of career that I might want, but it wasn’t like pinpoint, I’m doing this no matter what. It was a general direction. Mitch Matthews: Yeah, right. The clouds didn’t part, the sun shone down and God said, you will do this. It was like, okay, we’ve got a little bit more information. It’s guidance towards something. Tom Ziglar: Right. And so what you do is you kind of discover the general direction and then you go there as fast as you can and you get … The faster you go, the quicker you get the information to course adjust. So the first thing that I do is there’s like three circles. So one circle is, what are the problems that people naturally bring you? You’re just minding your own business and somebody comes to you and they say, Mitch, I’ve got this problem. Well if you look at those type of problems, that’s probably a clue because they’ve identified you as having some sort of gift or talent in that area. So are they relationship problems? Are they business problems? Are they number problems, what kind of problems are they? That’s a clue. The second one is, gosh, what is the biggest obstacle challenge that you’ve had to overcome in your life? Tom Ziglar: This could be a circumstance beyond your choosing. It just happened to you. It could be the consequences of a really bad mistake. And so you look at that and you look at all the lessons that you learned, all the positive scar tissue. And then the third one is what makes your heart sing. Like if you just sit there and go, okay, what gives me the greatest joy in life? And so the … What you do is, it’s like the Olympic Circles. Where those three circles intersect, where your natural problem solving ability connects with your scar, people who’ve had the same scar and what makes your heart sing. That’s probably where your passion is and here’s the thing. I believe this. I believe God, our creator put the passion inside of us and if we have the passion inside of us, that means it’s worthy to pursue. Tom Ziglar: And I think we go for our passion and our passion takes us to our why. And so you look at the biggest difference makers out there, they usually have a … They usually have a really brutal life experience that changes them and then they take their natural gifts and talents and their heart. You know what makes them … gets their blood boiling and all of a sudden that’s who they’re serving, because some people who are in, I call it the furnace. People who are in the furnace, a lot of times they only listen to other people who’ve had the similar furnace. Mitch Matthews: Yup. That’s right. They’re only taking advice from somebody with the same scars they got, right. Absolutely. Tom Ziglar: It takes a … It takes some age and a higher level of maturity to say, wait a second, I can take advice from people who haven’t experienced the same thing, because that to me is true maturity, is when you can say, wait a second, I don’t have to cut my finger off. Tom Ziglar: Let them cut their finger off. Mitch Matthews: That’s right. I’ll learn from that. I’ll [inaudible 00:14:45]. Tom Ziglar: Yeah, exactly. And so that’s what helps somebody started getting in the right direction, okay. So then I have this … So that’s the model, Joel Boggess shared that with me or I heard him talk about it, a presentation. I’m not taking credit for that, but that really, when I’ve talked with people about it, it just really makes sense. Tom Ziglar: Then I came up with this thing called the Trinity of Transformation and I have a metaphor and the metaphor, it’s in the book. The metaphor is the hot air balloon. And so this hot air balloon is the transportation device, or we could call it the transformation device that’s going to take you from where you are to where you want to go. It’s going to help you develop into the person that God created you to become. So this balloon has got to go across oceans and mountains, right. So that means it’s got to have fuel and it’s got to have altitude. Tom Ziglar: And so this is the way you do it. The first thing you do is in the basket of the balloon, you put two things. The first thing you put in is every dream, desire, goal, aspiration, anything that you’ve ever wanted to achieve, anything that you’ve ever wanted to be, do or have you put it all into the basket of that balloon. And then the next thing you put in that, because this is where you are, right. You’re in the basket of the balloon and then the next thing you put in the basket of the balloon are all of your gifts and talents, skills and experience. And so you dig into, golly, what am I naturally good at it? What are the gifts that God gave me? And this is a side note. Tom Ziglar: Dad said that success is the maximum utilization of the abilities that God gave you. In our culture, we look at social media and we think we get this fake masky view of the world. And we think, golly, everybody’s got it, but I don’t have it. And we compare our success to theirs and they’re completely different. So here’s what happens in them, in the basket of that balloon. Our desires, our dreams, and our goals start mixing around with our gifts and talents and skills and experience and they move around so much they ignite a little flame and then the balloon of hope, and you just picture the word hope on this big balloon, it starts to rise because we start thinking, wait, you know what? If I apply what I’m good at to where I want to go, I have a better chance to get there. Just like a football, I mean, how many field goals does Tom Brady kick in practice? None. That’s not his gifted talent. Tom Ziglar: So what do they want him to do? They want him to watch film, read defenses, work on his throwing, work on his timing, work on his footwork, because that’s what his skill is, that’s what his gift and talent is. And so when we start focusing on our gifts and talents and it starts mixing with our dreams and desires and that balloon of hope starts to rise, but here’s the problem, it only goes so high. So the furnace then, we notice the third component of the balloon, which is the furnace. This is what controls the fuel that lights the furnace and on the knob in that furnace, is this word and it’s a four letter word, and the word is grit. And so what we’ve got to do is turn the knob of grit and apply grit to our gifts and talents. And when we … and grit, Angela Duckworth and her writing. Grit is you get knocked down 100 times, you get up 101. The world says you’ll never do that, you say watch me. I mean, that’s grit, right? Tom Ziglar: But this isn’t American Idol where you show up for the singing contest. And obviously you can’t sing, the whole world knows you can’t sing, but it’s a shock to you that you can’t sing, right? Tom Ziglar: And he said, ” Oh Tom, you’re asking yourself the wrong … you’re asking the wrong question.” And I go, ” Really, what’s that? “He said, “Oh, you’re asking how do I do that? That’s not the question. The question is who should do that? Because the odds are pretty good that that’s a good idea, but it’s not in the sweet spot of your gifts and talents and you know somebody who it is in the sweet spot.” And that’s why God gave us each other and so what happens is as we turn that knob of grit, the fuel … the fire gets lit, we’re focusing on our gifts and talents. The balloon rises and then it suddenly comes to a halt and we look over the side of the balloon and it’s tied to the ground with all these ropes. And what are those ropes? Mitch Matthews: Those things are all connected. It’s all connected. I love it, which is a great segue because I know in the book, you do talk about getting clear on your why, starting to get clear on some of those goals, building a plan, all of that, but you also talk about the seven choices plan. Talk with us about that because it seems like that’s all very related as far as in regards to the choices that we’re making, because like you said, you start to get clear on the dream. You start to put that in with some passion. You start to put that in with some of your gifting and skills. Start to maybe turn the furnace on and get some grit going, but there are those ropes. So we got to cut and free ourselves up. So talk to us a little bit about that seven choices plan. Tom Ziglar: Yeah. So here’s how it works. Gosh, four years ago now speaking in Australia and this guy from the break because I like to … I like questions. I don’t know about you but [inaudible 00:22:34] in front of a group, I’d much rather handle questions than just yap, right. So I said, “Anybody have a question?” And this guy raised his hand and he said, ” What’s the fastest way to success?” And I’d never heard that question before. It’s always like the three keys to success or what does … And so I had the deer in the headlights look and then it just burst out. The fastest way to success is to replace bad habits with good habits and then we went to break. Mitch Matthews: Did you literally drop the mic? You could have just literally dropped the mic. Tom Ziglar: I didn’t even know I said it. We come back from break. Steve McKnight, one of my good friends who was hosting the event, he’s introducing me again after the break and before he brings me up, he says, “Everybody gets your pen out. Did you hear what Tom said? He said the fastest way to success is to replace bad habits with good habits.” And so I wrote it down. Mitch Matthews: Anybody else get this? That’s good. Yeah, I love it. Tom Ziglar: And so I … That night I googled it. Nobody had it, so I claimed it. And then at Ziglar, for 40 years we’ve been the Wheel of Life and the Wheel of Life has seven spokes on the wheel. And so the seven choices plan is about the seven spokes in the Wheel of Life. Here are the spokes, mental, spiritual, physical, family, financial, personal, and career. And so what I did is I dug deep and I said, wait a second. If in each one of these areas, we made a choice and mental to replace the bad mental habits with good mental habits, what would happen to our life? And then if we go to spiritual and we do the same thing, what would happen? And we go to physical and we do the same thing, what would happen? And so the seven choices are, in each one of those areas, we are choosing to get rid of some little bitty bad habits and replace them with little bitty good habits. And I say little bitty, on purpose because Dad develop the world famous termite philosophy. Are you familiar with that? Mitch Matthews: I don’t remember the termite philosophy, huh? Tom Ziglar: Yeah. So Dad said this, he said hurricanes and tornadoes get all the publicity, but when it comes to damaging homes, termites do more damage and they take such little bitty bites. And so I’ll just give you an example. In my mental life, so mental is all about input. The keyword for this choice is we choose the right input. When we choose the right input, it changes our thinking. It changes our beliefs. Those two things change our actions. The right actions get results, the right results create a life. And we do an action over and over again, it becomes a habit and that habit builds that life. And so as I was digging into this, I started thinking, gosh, quite often I’ll wake up in the middle of the night with a nightmare and then I realized I was falling asleep listening to the news. Well duh. Tom Ziglar: And so that’s a little bitty bad termite size, bad habit. I mean, what’s the big deal? It’s 10 o’clock, the news comes on, you doze off, you fall asleep and your wife turns it off. Well it spirals into I’ve got this unguarded input going in and my brain’s doing what it does, which is trying to make sense of it. And when people are … The news is not good. Mitch Matthews: Right. That’s their business, right? Absolutely. Mitch Matthews: Yeah. Start shutting this thing down. Yeah. Tom Ziglar: [inaudible 00:26:53] from email, from texts and then I like to go to bed early cause I get up early. So around 8:30, I’m really careful as to what goes into my brain, if I’m watching TV or whatever. And it’s just really … It’s neutral. There’s nothing in there that’s going to … And then when I go to bed, I’m now in that framework of, hey, I’m going to have a good night’s sleep. Mitch Matthews: Yeah, absolutely. That’s awesome, but again, it’s that little bitty thing that actually then as it goes through the filter of the input and then the beliefs, actions, results, it makes a difference. I love that. I love that. So I’ve got … We’re going to take quick break and then I’ve got two last questions for you Tom. So we’ll get a little word from our sponsor and then we’ll be right back. Mitch Matthews: All right. So two last questions and I’ve got 50 more questions that I’d love to ask you, but two more questions I’ll ask. One of which is, I know you’ve been working on this book for a while, but thinking about this book, and I know for you, this is just something, you didn’t just do this for the money, this is something you felt needed to be out in the world. But when I’ve talked with authors who’ve got a subject like that, they’re just passionate about it, it’s usually that they’re writing it because they’ve learned some things, but they’re also writing it because they need to remember some things personally. For you, what’s one of the things in the book that you cover that you need to remind yourself maybe that doesn’t come as naturally to you? What’s one of those things that you have to work on consciously that you cover in the book? Tom Ziglar: Yeah. Gosh, that’s like 90% of the book. Mitch Matthews: I love it. Tom Ziglar: To be honest, I mean for years, even before self-publishing, Dad would tell people you need to write a book even if it never gets published and even if the only people who read it are your family, you need to write a book on the things that you’ve learned that, to help you be successful that you think they might want to know. And so there is no better justification for writing a book then that even if you never publish it, even if it’s [inaudible 00:29:41] your family and so there’s a couple of things. One of the things that I know, and this is a huge difference maker. I already mentioned input. Input was the number one lesson I learned from Dad. The second thing that’s a game changer for me is, I call it the perfect start. And the perfect start, I’ve built my perfect start up. Tom Ziglar: In an ideal world, when I’m not on the road, when I’m … is three hours. And so what I do is, my perfect start is I start off, I get my coffee, I go to my office, and for five minutes, I do two chairs. Two chairs I learned from Bob Beaudine, one of my best friends. It’s a great book called Two Chairs. And basically what you do is, is you sit in the chair, you’ve got two chairs, one for you, one for God, and you ask God three questions. God, do you know what’s going on? Well, he’s big enough to handle it, right? Tom Ziglar: God, are you big enough to handle it? That’s the second question. And third, God, what’s the plan? And then you listen and so for me, that first five minutes of the day where I listen, God, it’s hard to keep your mind quiet. And then right after that I’ll do devotions, I’ll read inspirational material, I’ll pour into myself. Then I’ll do my goals planner, I’ll plan out the whole day and all … read scripture and all that. So that takes about 45 minutes and then the next 45 minutes I focus on my one thing. What’s the one thing I can do that changes everything? And so that’s my three hours, 45 and 45. Mitch Matthews: If you do something like that you want to make sure that somebody sees you. Tom Ziglar: Yeah, but that was that. So I caught that habit. Tom Ziglar: Right. Just watching his ability to own the day. In other words make … Happen to life, don’t let life happen to you. And so this concept of the perfect start is … Boy, I could just tell the difference in my day if I don’t have the perfect start. And for those of you listening, man, just if you don’t do that, just start with five or 10 minutes and just build on that. It will change everything. Mitch Matthews: That’s beautiful. That’s exactly where we wanted to land this thing. Okay gang, the book is called Choose to Win: Transform your Life, One Simple Choice at a Time. Tom Ziglar, thanks so much for spending time with us and sharing your wisdom and stories, my friend. Tom Ziglar: You bet and the book, it’s easy to find, just choosetowinbook.com. Mitch Matthews: There it is. Awesome, thanks so much. All right, Dream, Think, Doer. What’d you think? Leave a comment and let me know what stood out to you! I can’t wait to hear from you!